At Poo Patrol we advocate commnunity-led initiatives to tackling this problem. Indeed many initiatives have sprung up in novel forms. Poo patrol is a place where these local initiatives can share what they do and what works best. With this in mind, we are sharing some of the more radical and creative solutions! (originally posted at http://www.bbc.co.uk/news/magazine-22853270). Thought not clearing up would go unnoticed? 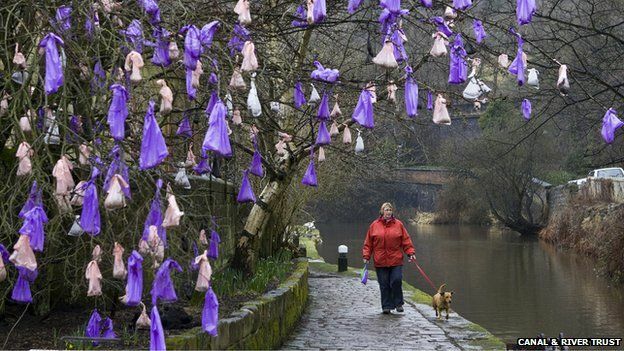 In Todmorden, West Yorkshire, British Waterways decorated a tree with dozens of brightly coloured dog poo bags, highlighting the problem of owners picking up, but then not disposing of waste. 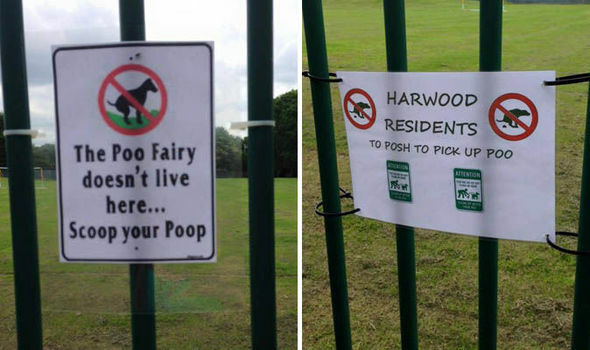 Poo Patrol’s own Spray Day used stencils, markers and spray kits to identify and recording the number of dog poos, whilst broadcasting a clear message for owners. In Dorset, feces rere painted bright green and West Dunbartonshire used bright pink! Elsewhere flags have been left atop poo mountains, often tagged with “humorous and caustic” messages. Sometimes the response goes even further…. near Madrid, volunteers identified irresponsible pet owners. 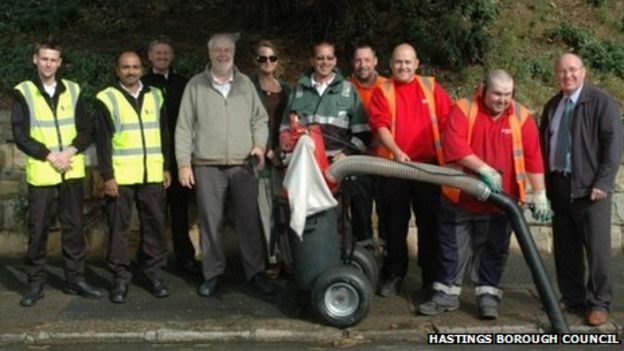 They returned dog poo to their owners in a ‘lost property’ box, resulting in a 70% drop in the amount of mess. A number of councils (not wanting to get so ‘hands on’!) introduced dog ‘poovers’, sucking up dog poo, using wheelie bins, motorbikes or carts. These carts may also convert the mess straight into slurry. These hoovers originated in Paris as an army of scooters (up until 2002), yet failed to clean up more than 20% of dog droppings. According to the leader of the Isle of Wight’s council, a DNA database for dogs would quickly solve the problem. Samples would be tested against the database and traced back to the owner. This might seem an extraordinarily expensive and messy process, requiring dog poo collection, laboratory analysis and the creation of a database. Yet it has been tried elsewhere, including Texas, Spain, Tel Aviv and Northern Ireland. In the US, the testing company PooPrints, markets itself to property managers as “the only permanent, ‘set it and forget it’ solution for dog waste”. These such signs similarly strike a note of frustration and aggression with bad owners. This kind of vigilante response has gone even further. In 2005 a South Korean woman refused to clean up after a dog on a subway train. Her photo was taken and posted online and she became notorious as the ‘Dog Poop Girl‘. Similarly, a Russian model ended an argument by flinging dog poo into the convertible of its unapologetic owner. Of course such approaches are themselves in breach of the law. But dog poo evokes an emotional and disgust response. Behavioural change is undoubtedly needed. The biggest factor in changing behaviour is campaigning. And attention grabbing tactics have significant impact. Newcastle University reduced bike thefts by 62% by placing pictures of staring eyes above cycle racks. Creative solutions such as these are a key part of challenging the problem. Poo patrol is a place where these local initiatives can share what they do and what works best. We are developing toolkits that you can download and try out. Please let us know how you get on! And if you want to kick-start something where you are, why not get in touch.